The Arrhenius definition is a substance that ionizes in water to product H+ ions. The Brønsted definition is a substance that is a proton (H+) donor. This does not require the substances to be in aqueous (water) solution). The Lewis definition is a substance that can accept a pair of electrons. This does not require a proton or aqueous solution. There are several other definitions as well. An acidic solution is defined as one that has a pH less than 7.0. The acids listed above are all examples of inorganic acids, sometimes called mineral acids. Mineral/inorganic acids can be strong or weak. 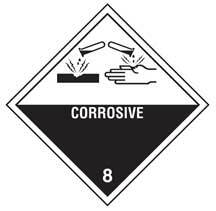 OSHA requires eyewashes and safety showers in workplaces where corrosive materials are used. Get yours from Safety Emporium. The "equilibrium arrows" between the starting material (reactant) and products indicate that the reaction proceeds in both the forward and backwards directions simultaneously with all species co-existing in solution simultaneously. The relative amounts of products and reactants once the system reaches equilibrium vary from reaction to reaction and are expressed using an equilibrium constant, a topic that is beyond the scope of this text. Organic substances with names that end in "oic acid" or "ic acid" are called carboxylic acids. Two of the examples we just looked at, formic acid and acetic acid are carboxylic acids. All carboxylic acids are weak acids. The strength of acidic solutions can be measured using the pH scale. The lower the pH, the greater the acidity of a solution. Just because an acid is weak does not mean that it can't harm you. For example, HF, hydrofluoric acid, is a weak inorganic acid. When you spill it on your hand it doesn't burn...but over the course of hours it migrates to the bones in your fingers and then begins to dissolve them from the inside out (a painful process; amputation can be required). In addition, systemic effects such as hypocalcemia can cause death. See the HF links under Further Reading below for more information. They have a sour taste (tasting acids...or for that matter, any chemical, is not generally recommended!). For example, the citric acid in lemons and acetic acid in vinegar are responsible for the sour taste of each. They can react with metals such as magnesium, zinc or iron to corrode them and produce explosive hydrogen gas. Do not store acids in metal containers! It is important to know the pH of substances because they may be corrosive or react with incompatible materials. For example acids and bases should not be stored or used near each other as their accidental combination could generate a huge amount of heat and energy, possibly resulting in an explosion - here is a terrific example of what can happen when incompatibles are mixed! pH is also important to know in case you spill the material on your skin or eyes. Whenever a substance enters the eye, flush with water for 15 minutes and get prompt medical attention. Special care needs to be taken when storing acids. Minor spills and acid fumes can quickly corrode standard metal storage cabinets or soapstone countertops, for example. 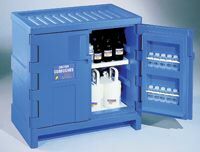 The best choice for storing acid containers is a chemically-resistant cabinet designed for that purpose, with polyethylene construction being the best choice for laboratory quantities of acids. Polyethylene spill trays are also a very good idea, whether acids are stored on a bench top or in a cabinet. Chem Team has a concise discussion, explanation and hints about acids and bases as well as some more detailed stuff for chemistry students. Hydrofluoric Acid Safety at Portland State University. Recommended Medical Treatment for Hydrofluoric Acid Exposure at Honeywell. They also have other useful technical literature. Case Study: Hydrofluoric Acid Fatal Accident at WorkSafe Western Australia. Fatality Due To Acute HF Exposure discusses the same accident.